This long and lean Japanese stretch crepe blazer with a draped collar takes a choose-your-own-adventure tack: Belt it for an hourglass effect, or leave it open for a more unstructured cool style. Designed with your wardrobe long game in mind. Made in NYC. Will ship in 1 week. Guaranteed by 12/24. Loose fitting draped collar blazer. Falls at the low hip. 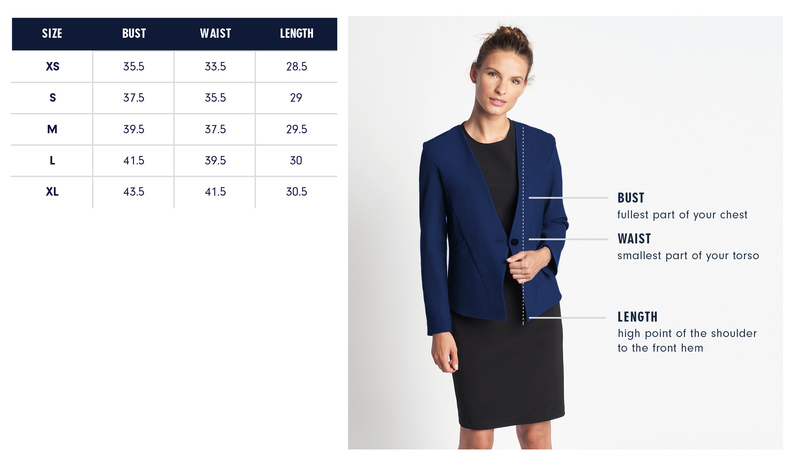 Our model is 5’10” and wearing a size S.
Below are the exact measurements of the Rogers Blazer. All measurements are in inches. For general brand fit, sizing, and measurements, please visit our Brand Fit & Size Guide. Hand wash; line dry. Do not tumble dry. Dry clean. Loose fitting draped collar blazer. Falls at the low hip. I designed this blazer to be worn effortlessly open or closed, belted or not. It has a relaxed elegance that pairs just as well with a tailored dress as a pair of jeans. Features: Patch pockets, self belt with gunmetal buckle, and hidden hook closures. Fully lined.